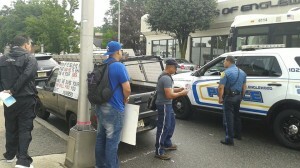 ENGLEWOOD, N.J. — A New Jersey police officer ticketed a Christian who was sharing the gospel outside of a local abortion facility this weekend after the officer took issue with a sign displayed on his truck that cited two Scriptures. 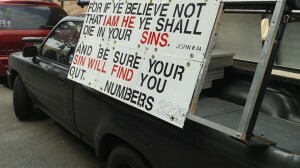 Luis Zapata says that he has posted Scripture and other messages on his vehicle for nearly two years as a means to witness to the public about Christ. Zapata, a Columbian-born Christian who lives just outside the town of Englewood, drives his vehicle through a number of cities throughout the area and has never had an issue with the display. Every week, he and other Christians preach the gospel at Metropolitan Medical Associates, one of the largest abortion facilities in the state, to help saves lives and reach abortion-minded mothers. But Zapata and his co-laborers for Christ state that the Englewood Police Department regularly harasses them outside of the facility—threatening them with tickets and arrest for preaching on the public sidewalk, parking their car at the library across the street, or any other infraction they might assert. On Saturday, Englewood police officer Mark Van Wormer approached Zapata as he was exiting his truck, and demanded that he removed his signs, which quoted John 8:24 and Numbers 32:23. Wormer than told Zapata that he needed a permit to display the sign on his vehicle and that he would have to take it down. Parker then called an attorney on behalf of Zapata, who advised that they move the vehicle for the time being. But some time later, Wormer returned with another officer and ordered him to provide his license and registration as he proceeded to write a ticket. Zapata disagrees that his sign had anything to do with advertising. Zapata said that he finds it ironic that the police will swear on a Bible in court, but then turn against those same verses when on the streets. Zapata urged other Christians to take a stand for the word of God despite what obstacles they may face.